Internet forums are full of questions entitled “where is my missing drive space”, or “HELP! 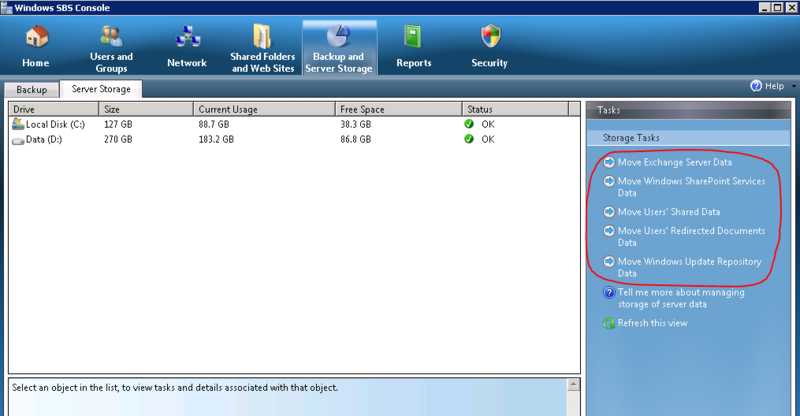 I am running out of drive space on the system partition”. There are some known issues, addressed below, where SBS is known to generate large log files but very often it is due to hidden contents of user folders. 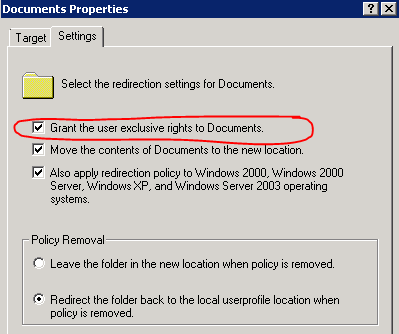 The Redirected Folders feature is usually enabled with SBS and with the default Group Policy a users folder is protected and hidden from view by all others, including Domain Administrators. 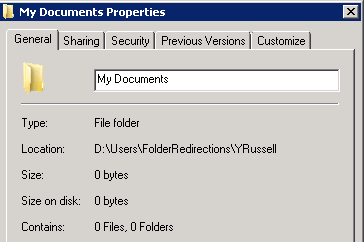 Therefore when browsing to a user’s private folders such as My Documents, not only will you be denied access, but the properties of the folder will show: Size = 0 bytes, and Contains = 0 Files, 0 Folders. This is due to a permission set by group policy, within the Small Business Server Folder Redirection Policy, when the folder was created. However, even though you cannot open the file, it is possible to see the contents of the folders (folder and file names) and the size of the contents by using an application named Treesize Professional from: http://www.jam-software.com/treesize/ There is a 30 day free trial period, but I recommend buying it to have in your “tool box” to quickly locate that user that has 30GB of movies saved in their redirected my documents. 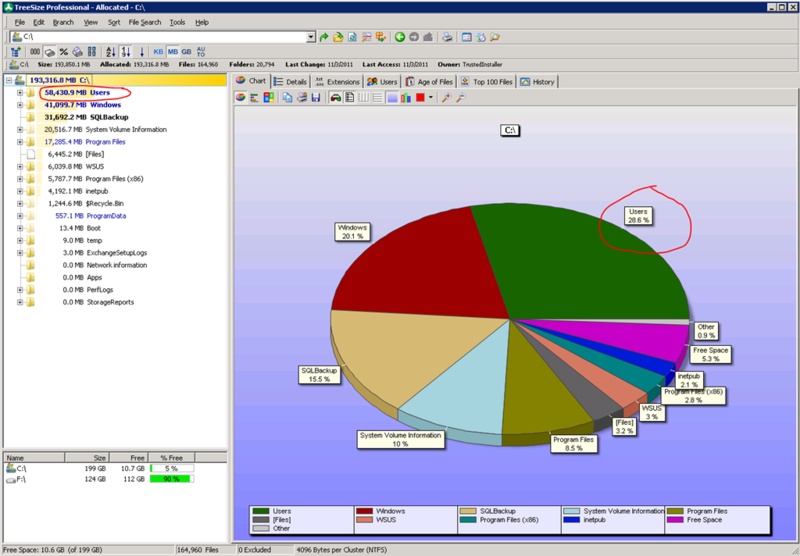 Treesize will provide a very nice graphical overview of drive space distribution and you can quickly drill down to the source of the problem. 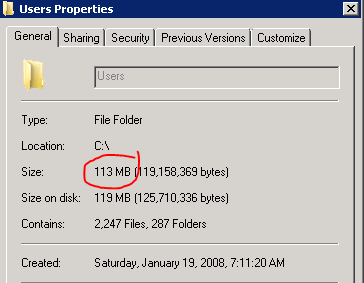 As an example; in the following two images of the same directory, Windows shows 113 MB in use, where Treesize includes the hidden directories and accurately reveals 58.4 GB of consumed drive space. Treesize can be used in many other ways for storage management but is invaluable in locating folders that are consuming large amounts of space on your drives. Tree size can also help to locate other space consuming culprits. Once located the information and links below, organized by file paths, may be able to assist with resolving. C:\Program Files\Microsoft\Exchange Server\Mailbox\xxxx Storage Group Keep in mind deleted e-mails are retained in the Exchange database until you do a backup using an Exchange aware backup application such as the built-in SBS backup utility.